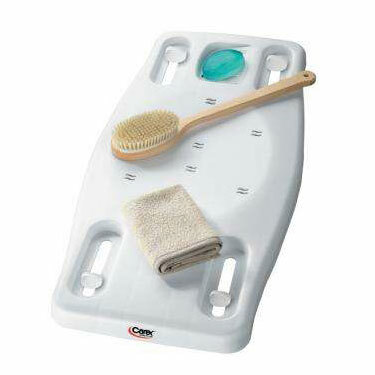 The Apex/Carex Tub Transfer Board\'s one-piece construction means easy cleaning and no corrosion. Adjustable width fits all standard tubs 19 - 28in.W. Rubber stops protect tub and provide secure placement. Built-in soap dish with drain holes. Works great for a need. We did not have to have our bath tub redo by buying this product. Pros:Easy to install, only took a few minutes. Strong not cheeply built.Can take with on trips if need be. Great product. Sturdy and attractive. very pleased, my husband had knee replacement and it made it very easy for him to get in and out of tub and shower.